A great way to discover New York City’s beautiful Central Park is on a bicycle. Explore everything the park has to offer — from the meadows, gardens and bridges to the performance centers, educational facilities, and classical architecture — all 843 acres with up to six miles of bike-friendly paths. From 1-hour to 1-day, this Central Park bike rental includes the use of a bicycle, helmet, lock, and free NYC bike map upon request. Choose from a Trek or Giant hybrid bicycle for all kinds of riding activities. 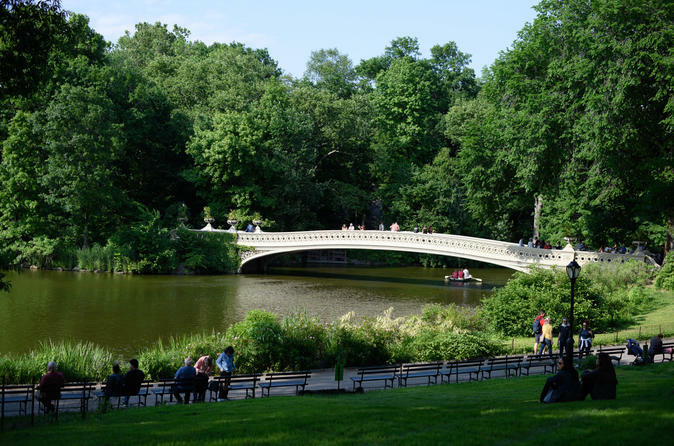 New York City’s Central Park is probably best known as the most visited urban park in the United States and one of the most-filmed locations in the world. But it’s the natural attractions and their beauty that make it really special. Central Park offers hundreds of special highlights for individuals and families across 843 acres. From green meadows, sprawling waters, gardens and unique bridges to performance centers, educational facilities, and classical architecture, the park’s greatest attraction is its picturesque beauty. Renting a bike is a great way to see it all. Enjoy the view and pedal at any pace desired, stopping along the way to explore at will. Visit Strawberry Fields, Cherry Hill, Tavern on the Green, Bethesda Fountain, Onassis Reservoir, Cleopatra’s Needle, the Dakota, and much more. A bike ride through Central Park begins with a Trek or Giant hybrid bicycle. Pick one and begin riding for an hour or a whole day. Enjoy the breathtaking views from flat, hilly, and scenic terrain. On a bike, it’s relatively easy to see a lot of the park in a short amount of time. Park rides provide three routes of varying lengths to choose from — 6.1 miles, 5.2 miles, or 1.7 miles. Ride one or ride them all. Sightseeing in New York City by bike is an easy way to see more. Other nearby world-famous attractions include the Metropolitan Museum of Art (MOMA), Times Square, and the Museum of Modern Art (MoMA). Tandem bikes (for two people) may be provided if available (although not guaranteed and will count as two bicycles). Road bikes, child bike trailers, and child seats may also available at an additional cost. It is possible to rent a bike from this location and drop it off at another location in the city. Please ask for more details at the shop. Bike rental and bikes are appropriate for all ages and skill levels, and one adult 18 or over must be present and responsible. Bicycle included and bike helmet available upon request, mandatory children under 14. Bike rentals typically sell out during the peak season of May-September, so book early to avoid disappointment.